You can "file" your event under successful when featuring this terrific marketing tool. 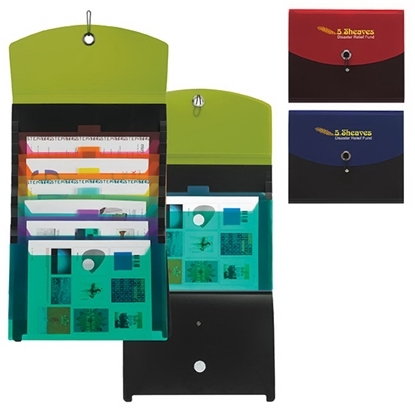 Our Cascade PolyPro Folder features 7 individual filing sections. The bungee-cord closure allows you to fill each folder and ensure that the cover remains closed. Measuring 10-3/4"w x 13-1/4" x 1"d; add your logo to create a wonderful corporate gift to help promote business. Per additional color; 1 additional day(s). Value and Free 24 hour service. Set the "pace" towards success with this fantastic marketing tool. 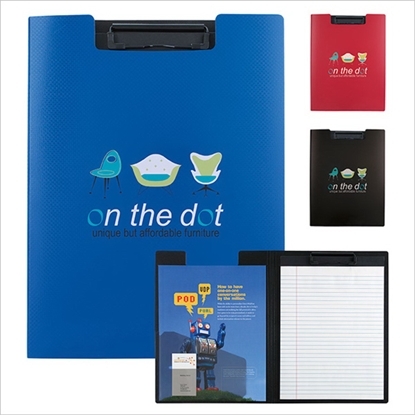 This Pacesetter Folder makes a handsome addition to any meeting. Made of bonded leather; this item features an inside flap pocket, 2 small pockets and a pen loop. Measuring 9-1/2"w x 12-1/2"h x 1"d when closed; this product also includes an 8 1/2" x 11" writing pad. What a terrific choice for a giveaway. For additional locations; please call for adjusted lead time. Let's "calculate" the success of your next event after featuring this item! Discover the benefits of a great, bonded leather folder with a built-in calculator. Measuring 9 1/2" x 12 1/2" x 1" when closed; comes complete with pen loop, two card pockets and large inside pocket. 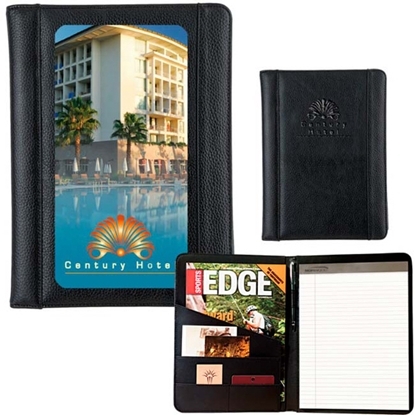 Made of bonded leather; it has two interior business card pockets, main interior pocket, pen loop in spine, 8 1/2" x 11" writing pad and calculator. Order today. Have a successful brand in your "pocket" when featuring this marketing tool. Our Allura Conference Folder features 2 large pockets to store loose notes and 2 card holder pockets. Measuring 9-3/8"w x 12-5/8"h x 1"d when closed; it also includes an 8 1/2" x 11" writing pad and interior pen loop. Add your logo to create a wonderful corporate gift for upcoming tradeshows and conventions. For additional locations call for adjusted lead time. Ensure your imprint will be seen often with this handsome genuine leather calculator folder. Measuring 10" x 13 5/8" x 1 1/4" closed; it has multiple pockets and zip closure. 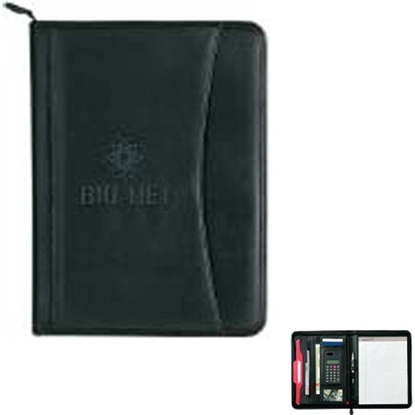 This leather zip calculator folder features expandable interior pocket, zip pocket, slip pocket, interior card holders, clear I.D. holder and calculator. Also has leather pen loop, exterior pen loop, exterior pocket, zippered closure and 8 1/2" x 11" writing pad. This marketing tool should be your company's "premier" choice! This rich leather folder features inside pockets and a pen holder to keep you organized. Made of genuine leather; this product features a pen loop, large interior pocket and 2 small pockets. 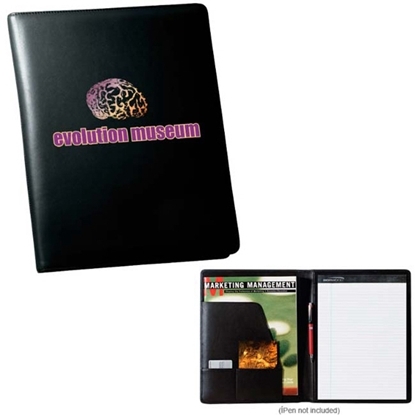 Measuring 9 1/2" x 12 1/2" x 1" when closed; this folder also includes an 8 1/2" x 11" writing pad. 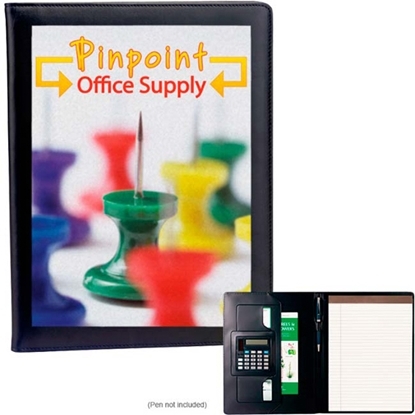 Add your logo to create a terrific corporate gift. Order yours today! 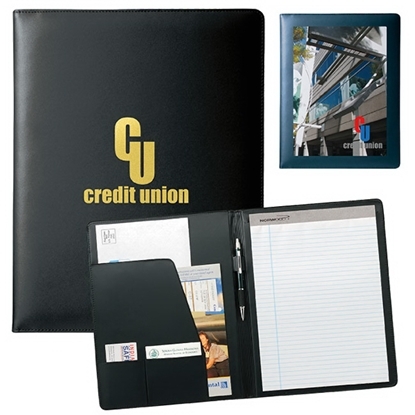 Mypromotionalpens.com offers the largest and best priced selection in Promotional Folders. We will price compete and we won't be under sold. Let our graphic designers make your personalized Folders standout above the crowd at no charge. We won't stop until you are completely satisfied with your custom Folders art proof.Use category search filters on your left to help narrow your search to find exactly what you are looking for.